The TMS320C6670 Lite Evaluation Module (EVM), or TMDXEVM6670L, is an easy-to-use, cost-efficient development tool that is designed to help developers quickly get started with designs using the C6670 multicore DSP. It includes an on-board, single C6670 processor with robust connectivity options that allows customers to use an AMC form factor card in various systems. It also works as a stand alone board. The TMDXEVM6670L EVM comes with XDS100 embedded emulation capability. In addition, an external emulator via JTAG emulation header can be also be used. Software accompanying the 6670L EVM includes Code Composer Studio Studio™ version 4.2 (CSv4.2), Board Support Package (BSP), Chip Support Library (CSL), Power On Self Test (POST), Network Development Kit (NDK), and Out of Box (OOB) Demonstration SW. The TMDXEVM6670L EVM is designed for an ease of use environment to evaluate the features & functions of the multicore C6670 DSP. The emulation capability and software included in the EVM will allow customer to program the C6670 DSP to benchmark the algorithms that are intended to be implemented on C6670 DSP. NOTE: The TMS320C6670L is expected to ship in late April 2011. 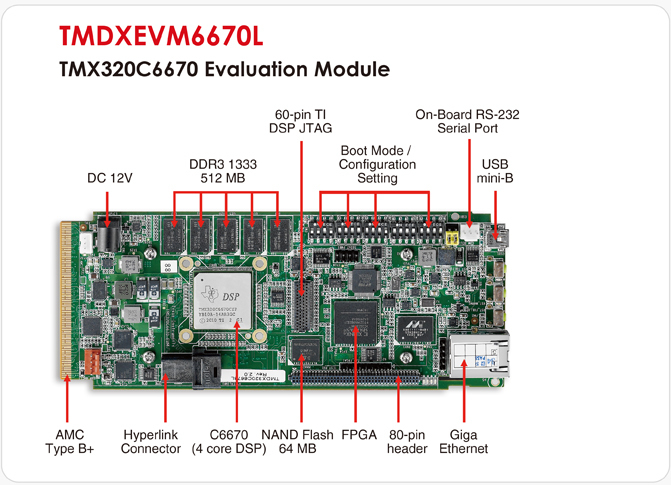 The TMDXEVM6670LE Lite Evaluation Module (EVM) is an easy-to-use, cost-efficient development tool that is designed to help developers quickly get started with designs using the C6670 multicore DSP. It includes an on-board, single C6670 processor with robust connectivity options that allows customers to use this AMC form factor card in various systems. It also works as a stand alone board. The TMDXEVM6670LE EVM comes with XDS560V2 embedded emulation capability. The software accompanying the 6670LE EVM includes Code Composer Studio Studio™ version 4.2 (CSv4.2), Board Support Package (BSP), Chip Support Library (CSL), Power On Self Test (POST), Network Development Kit (NDK), and Out of Box (OOB) Demonstration SW. The TMDXEVM6670LE EVM is designed for an ease of use environment to evaluate the features & functions of the C6670 multicore DSP. The emulation capability and software included in the EVM will allow customer to program the C6670 DSP to benchmark the algorithms that are intended to be implemented on C6670 DSP.